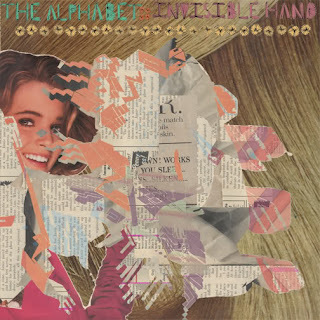 The Alphabet A-Side, 'Repeat' destroys... completely out of nowhere, all energy and mathy melody that explodes every other verse into cymbal crashes and guitar heights, this sounds amazing on vinyl...get an idea from their myspace, but it's just a thin sample of the full indie massive sound. I'm reminded of Lync, Cap'n Jazz those bands that I keep going back to, that more than just captured that time for me, they're still classic, for the songwriting, the raw energy. I think they could only have been made that time in their lives where everything has to be all out in the smartest most naive way. There's nothing to lose, maybe no one is listening, it doesn't matter, it's immediate, there's one chance to do this right. These guys have got that. Completely exposed and raw, with all the rocking energy they can possibly muster for this amazing 4 minutes. It's captured perfectly, huge drums, clean bursts, they know exactly what they want to get down, there's no room for too much delay or reverb, that would step on the next change. The harmonics, bent notes, the repeating guitar melody is just bordering on impossible. The vocals are slightly distorted and borders on falling apart emotionally. Matt's yelling, but always completely controlled. They even have it in them to change it up halfway through just in case you got too comfortable, just to smash it all apart again and again. This is definitely on 'repeat'. Complete genius. B-Side The Invisible Hand's 'Death Bellows 45' is a more contemplative bedroom project in the same raw exposed way. Acoustic strumming all underneath atmospheric rising loops, layered vocals from Adam Smith are perfect. Cheap metronome clicks and static environmental sounds providing this platform for a subtle vocal melody. From the rest of the tracks on their myspace, this is a complete departure. A technical intimate whisper against their usual rocking style. And hell this local newscast loves them. Both of these guys are serious finds and I'm glad to have been exposed to both of them. Get it from Funny/Not Funny, not to be confused with Not Not Fun, the best $5 you'll spend on a single. Download code included. Somewhere on either side of Mount Afton, Virginia, the best bands you haven’t heard yet are warming up their tube amps and plugging in their weathered Stratocasters in cramped, dingy basements. Harrisonburg, Va.-based Funny / Not Funny Records crystallizes this moment by pairing together the Shenandoah Valley sounds of Charlottesville’s The Invisible Hand and Harrisonburg’s The Alphabet. Both of these sides are great, and I'm definitely going to be looking out for their full length stuff in the future, and Invisible Hand is actually coming to Bruar Falls on the 13th, can't wait.